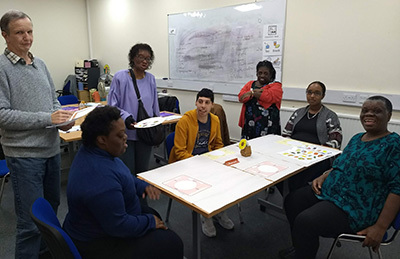 As part of Share's Independent Living Skills course, we run a weekly Steps class to support our students to take their first steps into employment. The aim of these sessions is to provide an introduction to work and prepare our students for employment – whether that is paid, voluntary or work experience. What is the difference between paid and voluntary work, and work experience? What are the rules of work? What behaviours, attitudes and attributes are right and proper for the workplace? The sessions are delivered as interactive group sessions, including role play (eg, working as a waiter or waitress in a restaurant to understand what constitutes good versus bad customer service), to give our students the opportunity to explore each subject in a practical way. These are then followed by one-to-one coaching for students to discuss their personal needs and aspirations. As part of this work, our job coach works with our students to find work experience and volunteering opportunities in the community to allow our students to see at first hand what the world of work actually looks like. In addition, Share's social enterprises – Share Nurseries and Share Catering – also provide real-life work experience (eg, the importance of customer service and quality control) for our students to help them get ready for work. To find out more about our Steps programme, contact Claire Smith, Share's job coach, via email claires@sharecommunity.org.uk.